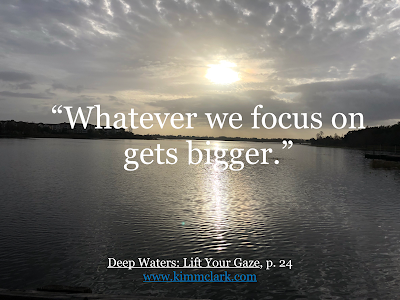 Deep Waters: Lift Your Gaze: "I uphold EVERYTHING..."
Upon considering Jesus’ power, wisdom, transcendence, I wondered, how does something that is formed respond when its very Creator walks among it? Did the earth groan when Jesus came down from his heavenly throne to be born of flesh with human limitations? Did the waters quake in reverence? Did the skies just breathe a sigh of relief that destruction did not abound on this trip? Did our Lord smile with each step, knowing the composition of each particle he stepped on? Did the earth beg to be restored to its former glory—the one Adam and Eve so freely enjoyed when they thrived in the Garden? Or did Jesus tell the earth’s core to “Hush!” as he did the storm? Did he lovingly pour out his peace, so the planet wouldn’t shudder, as he proclaimed the good news, performed miracles, and died on a piece of its wood from its womb? In awe of how creation withstood such holiness, I am thankful Jesus stepped down from his heavenly throne, humbled himself, and became a baby, born of a virgin. I am captivated with gratitude as he lived a life without sin. With a grateful heart, I am enthralled by his humility, as he received all the punishment for my sins on the cross from a tree he created, and rose from the dead in victory, so I am now reconciled with a holy God. Dear God, help us see with new eyes the immensity of your mercy and love. Give us an eternal perspective on the miracle of Christmas, the sinless life Jesus lived, and his work on the cross. Have us praise our Savior with a greater appreciation of how he stood in our place. Bless those who are struggling right now, help them lift their gaze to you the author and perfecter of our faith. In Jesus’ precious name, I pray. Amen.